As far back as forever, the film industry has been doubling down on its surprisingly niche films, cashing in on meteor-driven apocalypses, erupting volcanoes, or even the story of Wyatt Earp, all in stereo. With the massive critical and commercial success of actor John Krasinski's directorial debut, A Quiet Place, it's not wholly surprising to find that studios want to cash is on the success, with Netflix already serving up their own decent enough twist on the theme, with last year's Birdbox. What is interesting is that this latest Netflix production was actually based on a 2015 novel, and further was shot in 2017, taking its sweet time making its way onto the streaming giant when they could have arguably beaten A Quiet Place to the punch (c.f. Costner's Wyatt Earp being beaten out of the gate by Tombstone) and, in the process, perhaps avoided many of the striking similarities which almost make this high concept horror feel like a prequel to the hit. The story follows a family who get swept up in the mayhem that ensues after a cave research team unearth flying bat-like creatures from deep underground. The vicious beasts soon threaten to take over the planet, hunting down anything that makes a sound, leaving the family to walk in silence, improvising along their way and using sign language - learned after a car crash left the teenage daughter deaf - to communicate. 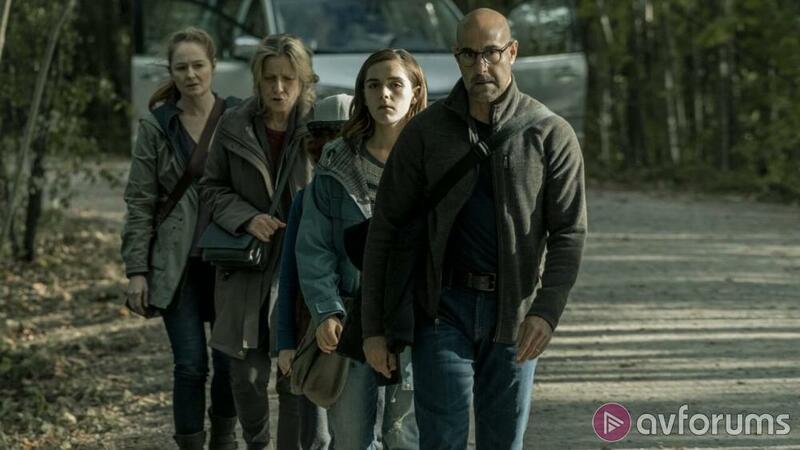 The Silence relies heavily on a solid cast, with Stanley Tucci on hand as the pragmatic dad who holds the whole family together, and Kiernan Shipka - recently catapulted to fame thanks to Netflix's surprisingly feisty Sabrina the Teenage Witch sequel series, The Chilling Adventures of Sabrina - leading the younger cast as the recently deaf daughter whose main form of communication proves key to the family's survival. Fellow Sabrina star Miranda Otto, My Big Fat Greek Wedding's John Corbett colour in the peripherals, but it's Tucci and Shipka that drive the piece, which often goes 'silent' for large swathes, reliant upon a little sepia grading and some vacant streets and bloodied, crashed vehicles to convince of the apocalypse. Annabelle director John R. Leonetti is no stranger to horror, managing to put together a few tense setpieces and, whilst the resultant tension is nowhere near the level of that other silent movie, there's enough here to make for a fairly taut 90 minute outing. Indeed The Silence squeezes in a reasonably tense climax, with even a little ingenuity that finally offers some innovation on the premise. Unfortunately the twists may appear strikingly familiar for those who have seen Birdbox and, by waiting until the very last minute, it perhaps feels like too little, too late. Certainly both of the 'silent' films owe a great deal to David Twohy's Pitch Black, with The Silence going for high visibility when it comes to the creatures, and thankfully the effects proving largely up to the task. Sure, the lack of Dolby Atmos and Dolby Vision are a little disappointing as we've come to expect both from Netflix's latest productions, but it's a healthy looking feature, not as effective as Birdbox, and nowhere near the level of A Quiet Game, but reasonably efficient nonetheless, and just about making for a decent enough night in on the big small screen. Write your The Silence (2019) Movie review.